This article by Maeve McClenaghan highlights an important issue affecting the education of young asylum seekers. 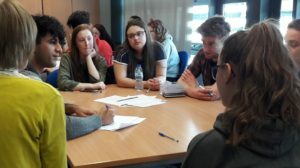 Colleagues in the FE sector have expressed great concern for the well-being and prospects for success of asylum seekers who access their adult provision. 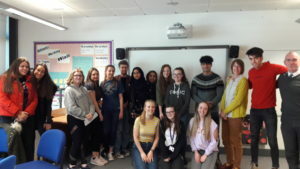 Twenty students and staff from the Faculty of Education volunteered for a Farsi taster session this week. Our teachers were two refugee volunteers from Iran, supported by West Lancs CVS. As new learners we were told to ‘Put away your British accents’. 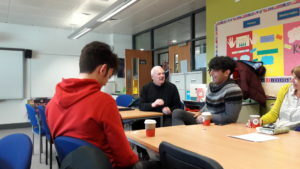 Working in small groups, the trainees and staff enjoyed the opportunity to hear about living in Iran first hand, from cuisine to education options. 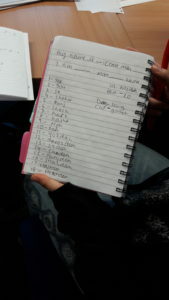 In the session students discovered borrowed words from French, different ways of speaking about gender, discovered ‘Finglish’ (Farsi in roman script) and even tried their hand at writing their names in Persian. Learning some language basics including greetings, introductions and numbers may seem a small thing, but even this kind of simple preparation can make a world of difference in welcoming new students to the classroom, as well as fulfilling one requirement of the Teaching Standards (to meet the needs of EAL students). Farsi may be new to many of the group, but it is spoken by over 100 million people in Iran and beyond. According to Home Office statistics, refugees from Iran are currently the largest group applying for asylum in the UK (2016 figures). Faculty staff are working to ensure that in addition to support for EAL delivery, students leave EHU with an understanding of the needs of refugee students. Action for Refugees is keen to develop this opportunity for more trainees, and plan to hold a session to put together classroom resources in a range of languages to support EAL next month. For more information about these sessions contact Action for Refugees. To volunteer to support refugees in the area, check out our volunteering page.